The city was incorporated in 1823, separated from Chelmsford. The Masons of Lowell, to the number of 200, assembled in their hall on Thursday evening, November 13th, and presented to the Lowell Masonic Association a portrait of Bro. William Salmon. The association has charge and control of the general property of the fraternity, its hall, etc. Bro. Salmon has been its president for many years. In addition to holding the chief offices in many of the various bodies, he has given a vast amount of time and work in advancing the prosperity and success of all of them, and won the confidence and esteem of his brethren. A pleasing programme was arranged for the occasion and successfully carried out. After the presentation ceremonies, the brethren repaired to the banquet hall, where a bountiful collation was served, and an hour or two spent in appropriate speeches and social greetings. The whole affair was alike honorable to Bro. Salmon and to his brethren. The portrait hangs, with those of other worthy Lowell brethren, in the main hall of their commodious apartments. Ancient York Lodge, from 1852 to the present. Kilwinning Lodge, from 1866 to its merger with William Sewall Gardner Lodge in 2007. Pentucket Lodge, from 1823 to the present; note that Lowell was not yet in existence when the lodge was chartered (it was in Chelmsford). William North Lodge, from 1867 to the present. William Sewall Gardner Lodge, from 1928 to its merger with Kilwinning Lodge in 2007. William Sewall Gardner-Kilwinning Lodge, from 2007 to the present. 06/12/1872: 1872-118; Hall dedication reported in the Grand Master's Address at the June Quarterly. (held 02/13/1872; see below). 01/28/1913: 1913-10; Hall dedication, at a Special Communication. 09/08/1928: 1928-179; Corner-stone laying, at a Special Communication. 10/08/1929: 1929-165; Hall dedication, at a Special Communication. M. W. Sereno D. Nickerson, G. M.
R. W. Percival L. Everett, D. G. M.
R. W. Charles Kimball, S. G. W.
R. W. Tracy P. Cheever, J. G. W.
R. W. Benj. Dean as Grand Treasurer. R. W. Charles W. Moore, C. G. Sec. R. W. and Rev. Chas. H. Titus, G. Sec. as G. Chaplain. W. Andrew J. Smith as S. G. D.
W. R. Montgomery Field as J. G. D.
W. W. H. Chessman, G. Mar. R. W. W. F. Grammer, D. D. G. M.
R. W. Henry P. Perkins, D. D. G. M.
R. W. Joel Spaulding, R. W. Wm. Sutton, and R. W. W. F. Salmon, P. G. Ws. R. W. Winslow Lewis, Wm. Parkman, John T. Heard, and William S. Gardner, P. G. M.
Bro. F. A. Pierce, Grand Tyler. and by the presiding Master of the united Lodges, in an exceedingly neat address, to which Grand Master Nickerson made an appropriate response, and the Grand Officers took their places. The usual ceremonies of Dedication followed, and being interspersed with music by an admirable choir, were effectively and impressively rendered. These being concluded, the officers of the Grand Lodge resumed their places, and Grand Master Nickerson briefly addressed the Brethren, congratulating them on the beauty and convenience of their new apartments, and their great prosperity. He reminded them that the hall had been dedicated to Freemasonry, and expressed the hope that it might never be used for any other purpose. He did not approve of public exhibitions in apartments set apart and dedicated to the sacred purposes of the Order. He thought such exhibitions did no good, while they rendered the formulas of the Institution unnecessarily popular and common. He earnestly protested against the frequent publications of Masonic elections and installations in our secular papers, and expressed the hope that a practice so offensive to good taste and the true spirit of Masonry, might be dispensed with. He also reminded the Brethren that the hall had been solemnly dedicated to Virtue, and expressed the hope that in the admission of candidates, the different Lodges that were to occupy it, would never be unmindful of the important lesson which that dedication teaches. It is not enough, he said, that the candidate is a "good fellow"; he should be good, upright and honorable in all respects, for in such members the strength and usefulness of the Institution lie. 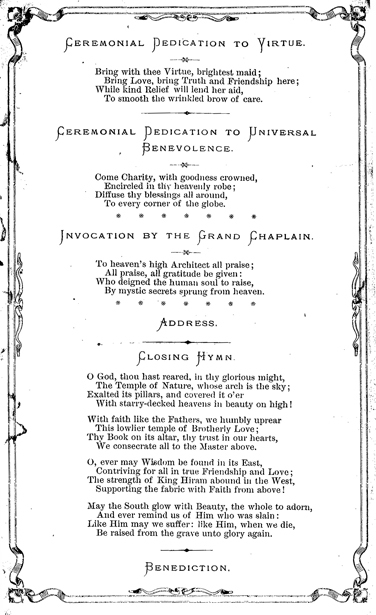 He next spoke of the dedication to Universal Benevolence and urged upon the Brethren as an important duty, the cultivation and practice of an enlarged Charity, saying he hoped that in a short time the Grand Lodge of the commonwealth would be in a condition to co-operate with them more liberally than it had recently been able to do, in giving vitality and efficiency to this over-topping purpose of our Institution. And in conclusion he introduced R. W. Bro. William S. Gardner, P. G. M. as the orator of the occasion. We took no notes of Bro. Gardner's address, and as it will probably be soon published by the Lodge, it is perhaps as well that we did not. We shall be able to do better justice by it when it is before us in print. It was of course and able an interesting performance. The speaker sketched, with great minuteness of detail, the introduction and rise of the earliest Lodges in the District; referring in fitting terms to the many distinguished Brethren who were identified with them, and contributed to their respectability and prosperity. The first Lodge in Chelmsford, now Lowell, was Pentucket Lodge, organized under a Charier dated March 9, 1807. Starting from this point, the speaker graphically traced its progress up to the present time—indicating with great particularity, the different locations, rooms, halls and dwellings, in which, in its infancy, it was fostered and nurtured into maturity. This part of his address must have been particularly interesting to the Lowell brethren, as several of these ancient places of meeting are still in existence, and we think there were some aged Brethren present, who in early life were accustomed to practice their Masonry in them. The speaker also noticed in suitable terms the several Lodges and other Bodies in the city of more recent date, and in conclusion paid a just tribute of respect to the memory of distinguished Brethren, who having acceptably performed their labors here, have from time to time passed on to a higher sphere of duty. The Grand Lodge then retired and was duly closed. In the evening a reception was given by the Brethren to the ladies, at which some 1200 persons were admitted by ticket. After viewing the premises and admiring the beauties of the apartments, the company were shown up to the banqueting hall, where tables were spread with such luxuries and dainties as the season afforded, and the genius and good taste of Bro. J. B. Smith, the distinguished caterer of this city, could suggest. Under the blaze of the brilliant gas-lights from the chandeliers, they presented an elegant and inviting appearance, and we do not doubt that ample justice was done to the many good things spread upon them, by the many gratified guests present. We are indebted to the Vox Populi of Lowell, for the following description of the edifice. "It is a handsome structure standing on Merrimac street, its iron and granite facing of pleasing proportions rising between the city numbers "64" and "74." There is nothing particularly striking in its aspect, being of no recognized style of architecture. Still its fine granite face marked with good architectural effect, with well-chiseled belts and a centre break, towering to a Mansard roof of good proportions surmounting the three stories, command the attention of the stranger. It has been erected by ex-Mayor Hosford, and was commenced more than a year ago. It was the intention of finishing the third and fourth floors for Masonic purposes, and under the care of a committee representing the several Masonic bodies of Lowell, the work to the fitting and furnishing has been prosecuted. The third floor is reached by a spacious staircase. The main hall occupies the whole of the front on Merrimac street, and is 49x38 feet, and clears 17 1-2 feet. This hall is lighted by six long windows, and the breaks made by these in the walls give character to a handsome fresco design. The furniture is of walnut, heavily carved, and upholstered in maroon terry; the carpet is a heavy English Brussels, and the ceiling most elaborately and uniquely frescoed, blends in colors with the elegance it canopies. At the rear of the organ is a small ante-room, entered from the entry way. This contains black walnut cases for the wardrobe of each of the bodies. Opposite the hall is the armory of the Pilgrim Commandery, which in size is 29x17 feet. It has cases for 180 members. Certainly, it is in finish, convenience and richness of its furnishings one of the finest in the State. The cases are ornamented with silver trimmings; from the ceiling depends a beautiful chandelier, and this, with several bronze and metallic knights, were the graceful gifts of friends. In the ell is a flight of stairs leading to the floor above, at the side of which is a passage-way leading to the ante-rooms. At the right of this passage is a small hall, entrance opposite that of the large hall. It is 30x20 feet, and in finish is a fitting associate to the apartments referred to. The fourth floor is in finish much more simple, but its arrangement is worthy of remark. It includes a banquet hall, which is 49x38 feet. This is over the larger hall of the third floor, and is supplied with all the portables and fixtures to which it is devoted. On the side opposite the landing on this floor, and comparing in size with the armory below, is a room where the cases from the old armory are set up, and the place otherwise made pleasant. At the extreme end of the ell is the modern kitchen, and this is in every way supplied with domestic tools used in that branch of masonry. On this floor are also ante-rooms used by Mount Horeb R. A. C., Pentucket, Ancient York, Kilwinning, and William North Lodges." We have not room for a more particular description of the apartments than is given above, nor does this seem to be necessary, our contemporary having so well relieved us of the duty. We cannot however leave the subject without expressing the personal gratification we felt in passing through the various apartments; all of which, without an exception, are distinguished by good taste, harmony of design, and liberality of expenditure. The small hall referred to above, and which we understand will be used as the Prelate's room, is a perfect little gem. We don't believe it is equalled by any similar room in the commonwealth. The armory is another, and the larger or working hall is in harmony with them. The frescoing impressed us most favorably, particularly the figure over the Senior Warden's chair in the West. Ingeniously relieved as it is by a mechanical arrangement of the canopy, it presents a finish and boldness of relief seldom met with. But where everything is so well done, it is hardly worth while to discriminate in favor of any particular part. We congratulate our Brethren of Lowell on the completion of their work, and the admirable manner in which it has been executed. Masonic Temple, Lowell, Mass., has been purchased by Arthur G. Pollard of A. G. Pollard Co. Harry G. Pollard, a son, and Harry Dunlap, both partners in the same company have purchased Davis Block. These two estates adjoin the store of A. G. Pollard Co., and presumably will be added to it giving it a frontage of two hundred feet on the main street of Lowell. Arthur G. Pollard is the well known past General Grand High Priest of the General Grand Royal Arch Chapter of the U. S. Both of bis partners mentioned above arc also active Masons. Companion Arthur G. Pollard is the leading merchant of bis city, he is no less distinguished for bis valuable Service to the masonic bodies with which lie is connected. Among many notable Masonic events that have attracted the attention of the brethren of Lowell, Mass., none have been more heartily observed or more cordially enjoyed than the dedication of the new Masonic Hall by the officers of Grand Lodge of Massachusetts, Tuesday, January 28th. The officers of the Grand Lodge went from Boston in a special car. Their number included Rt. Wor. Leon M. Abbott, Senior Grand Warden and acting Grand Master in consequence of Grand Master Benton and Deputy Grand Master Fletcher being absent from the State for the purpose of constituting Sojourners Lodge at Cristobal, Canal Zone. Recording Grand Secretary Davis was also absent from the same cause. He and the Deputy Grand Master, however, were on their way home at that time and were able to telephone their congratulations from New York. I consider myself fortunate indeed that tonight as Master of Pentucket Lodge, the senior Lodge of Masons in Lowell, I have the honor and the very great pleasure of welcoming you as the representative of the most Worshipful Grand Master of Masons in Massachusetts, together with the Grand Officers and your suite of distinguished Masons, to this meeting of the members of the four Masonic Lodges in Lowell. I welcome you, Right Worshipful, in the name of the mother Lodge Pentucket (and she is a venerable mother 106 years young) and in the name of her three healthy, vigorous and prosperous children, Ancient York, Kilwinning and William North Lodges, aH of whom combine a membership of sixteen hundred Masons, everyone of whom is, I assure you, as loyal to the Grand Lodge of Massachusetts which you represent, as can be found anywhere in this Commonwealth. Our membership is drawn from every walk of life, and perhaps our chief source of strength lies in the fact that the professional man sits beside the business man in our lodge-room, the manufacturer and the operative in his mill meet here on the level and the banker and capitalist here clasp hands with the mechanic and the farmer. Now in the beginning, Right Worshipful, Pentucket Lodge started with a charter membership of fifteen and of course during all these years our steady growth has necessitated the use of larger and still larger accommodations and we have met in no less than eight different lodge-rooms during our career as Masons and tonight, Right Worshipful, we have invited you here to place, if you please, the seal of your approval on the finished work of the Craftsmen who have labored so long and so faithfully to provide for the brethren of Lowell a meeting place which shall contribute more bountifully to their comfort, be a delight to their aesthetic sense and shall be also an honor to the craft of which we are proud to be members. Right Worshipful, believe me, when I say to you, that you are most welcome in this new home of the Masons of Lowell. 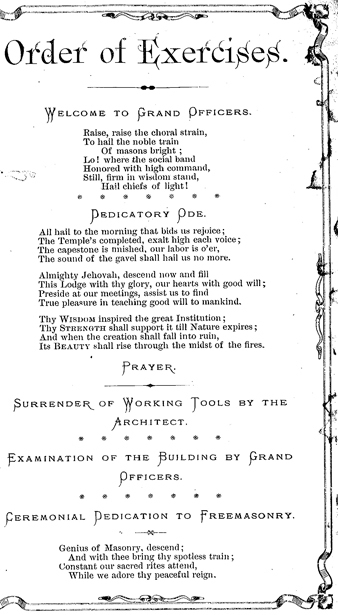 Prayer, and report of the executive committee, Past Masters Frank L. Weaver, Avery B. Clark and Frank K. Stearns. The new Masonic Hall is one of the finest and probably the largest in the State. It is of classic design inclining toward the Corinthian. It is handsomely furnished by the contributions 0f individual brethren. The Masons of Lowell may be congratulated on the possession of such a noble hall; it fitly expresses the character of the large hearted brethren who made it possible of attainment. The closing feature of the evening was the presentation of a portrait of Right Worshipful Solon W. Stevens in oil by Arthur M. Hazard, the celebrated artist. This picture has been placed in the new hall with those of Charles C. Hutchinson, Arthur G. Pollard and the late Hon. Charles A. Stott. Mr. Stevens has been prominent in the order for years and has been the orator on many occasions. He is a past commander of Pilgrim Commandery, K. T., also a past grand warden and is affiliated with a number of local organizations. The Lowell Masonic Association has awarded contracts for the erection of a new Masonic Temple on land already acquired and cleared in Dutton Street, adjacent to the Yorick Club. The whole cost will be $200,000. A general contract was awarded to John A. Simpson of Lowell, and other contracts also went to local firms. Work will begin at once. The special building committee of the Masonic Association, which has handled the details of raising necessary funds and approving plans for the new temple is composed of Arthur D. Prince, chairman; Charles E. Bartlett, secretary; Harry G. Pollard, Avery B. Clark and Frank L. Weaver. 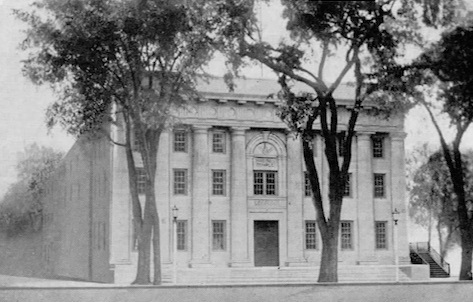 Since the Masonic Temple in Lowell was destroyed in the fire which swept the Pollard property in Merrimac Street in 1926, all local bodies of the fraternity have used temporary apartments in the First Universalist Church. Arthur G. Pollard, dean of Lowell merchants, March 28th, presented to the Masons of Lowell a check for $10,000 to aid in erecting the new Masonic temple here. Bids have been received on the proposed structure. Bro. Pollard's gift was made on the occasion of the initiation of his grandson, Arthur G. Pollard 2d, into Pilgrim Commandery, Knights Templars. Lowell Masons recently celebrated with a banquet, which high officials of the order from all parts of New England attended, the formal dedication of their new temple in Dutton Street, a magnificent home for the eleven active local bodies of the Ancient Free and Accepted Masons. The actual dedication took place, in the afternoon in Grecian Hall, one of the most beautiful sections of the new building. Most Worshipful Herbert W. Dean, Grand Master of the Grand Lodge of Massachusetts, presided at the dedication ceremony and to give the chief address. while the Lowell Masonic Choir provided music. The evening exercises opened with selections by the Lowell Masonic Orchestra, and there were brief addresses bv the following officials: Mayor Thomas H. Braden. Most Worshipful Leon Martin Abbott, past Grand Master and Most Puissant Sovereign Grand Commander of the Supreme Council 33°, N. M. J.; Most Excellent Winthrop J. Cushing, Grand High Priest of the Grand Royal Arch Chapter of Massachusetts; Most Illustrious Olin D. Dickerman, Grand Master of the Grand Council of Royal and Select Masters of Massachusetts; Right Eminent Clarence B. Burleigh, grand commander of the Grand Commandery of Knights Templars of Massachusetts and Rhode Island; and Most Worshipful Dudley Hays Ferrell, past Grand Master and commissioner of relief for the Grand Ledge. Later there was music. The new temple, one of the finest Masonic homes in the East, has a particularly impressive exterior. The walls are of light brick, while on either side of the main entrance are four massive pillars, the outstanding feature of the temple's Roman Doric architecture. The entrance is guarded by two huge bronze doors, designed in the utmost simplicity. Above them is the inscription. "Masonic Temple," in large bronze letters, and above this is a bronze reproduction of the square and compasses, emblem of the Masonic fraternity. Powerful flood lights, on evenings when Masonic meetings are being held, will illuminate the entire front of the temple. Inside, one first enters a vestibule completely finished in black marble and then continues into the large entrance hall. To the left of the hall is a spacious reception room. Directly opposite the doorway is a large mirror. Solid walnut furniture, attractively upholstered, completes the picture. To the right of the entrance hall is the smoking room, furnished in leather with comfortable chairs and lounges. Continuing along the hall, one comes to the foyer where there is a large bronze memorial tablet bearing the names and lodges of many prominent Masons of former days. Beneath the tablet is a long table with lounging chairs at either end. To the right of the foyer is a large coat room. The walls and ceilings of these lower rooms are finished in old ivory. The vestibule, entrance hall and foyer are lighted by huge bronze lanterns, suspended from the ceiling, and the reception room and smoking room are lighted by beautiful chandeliers. From the left of the foyer to the lodge rooms on the second floor a marble stairway leads, at the head of which is a lounge with chairs and divans. The Grecian hall, or main lodge room, is of Greek Doric design with pilasters reaching from the floor to the coping. The furniture is solid mahogany, upholstered in blue mohair plush. A beautiful brown carpet on the floor provides a delightful contrast. Lights are hidden behind the coping, throwing illumination up to the cloudy canopy of the arched ceiling which is painted to represent the sky. Special control equipment makes it possible to dim these lights and provide the effect of hundreds of minute stars peeping through the clouds. A new organ, donated by Harry A. Thompson, has been installed. At the east is a large stage, fully equipped, and on the other walls hang beautiful tapestries. The hall will seat 275 people. On this same floor are the Egyptian hall, which is a smaller but no less attractive lodge room: equipment rooms, officers' room and a safety vault. On the third floor is the lower armory for use of members of Pilgrim Commandery. Knights Templar. Directly above is the upper armory with more lockers and at the front of the third floor is the third lodge room or Sodality hall. This will be used as an auxiliary lodge room, as a rehearsal room and as a meeting place for the Order of De Molay. The Temple Club has quarters on the second and third floors. spacious and elaborately fitted out. The banquet hall on the ground floor is beautifully finished in oak and has an excellent dancing floor. There is a large concert stage on one side and dressing rooms in the rear for entertainers. Adjoining the banquet hall is I a large kitchen, equipped with all tin I latest cookinsr appliances. Perley F. Gilbert, Lowell architect, designed the building, the cost of which is estimated at more than $300,000. 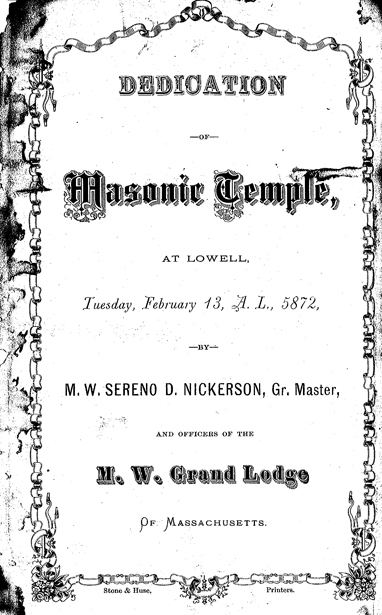 Lowell holds a distinctly high honor in Free Masonry in that there are connected with the various lodges of the Ancient Free and Accepted Masons here, one active and twelve associate members of the thirty-third degree or Supreme Council of the Ancient Accepted Scottish Rite for the Northern Masonic Jurisdiction of the United States. This is probably the largest number of thirty-third degree Masons in any city the size of Lowell, anywhere throughout the entire country. Arthur G. Pollard, who for years has been an outstanding figure in Masonry in city, state and country, is the local active member of the Supreme Council. He is one of four Massachusetts men holding such an honor. He received this degree in 1895. The other thirty-third degree Masons of Lowell and the years in which they received the degree are as follows: Frank K. Stearns, 1905; Harry G. Pollard, 1912; G. Forrest Martin, 1914; Herbert E. Fletcher, 1915; Arthur D. Prince, 1917; Lucius Derby, 1919; Donald M. Cameron, 1921; John F. Sawyer, 1922; Charles Bartlett, 1923; Harry A. Thompson, 1923; Henry H. Harris, 1925; and Frank L. Weaver, 1929. All of the Masonic bodies in Lowell will have their meeting places in the beautiful new temple which has been recently dedicated at Lowell, Mass. There are in the city eleven bodies of the Masonic Fraternity. Five are Blue Lodges, three are York Rite bodies, and three are Scottish Rite bodies. It is said of Masonry in Lowell that it was organized and has developed with the city. Members of the several lodges have played prominent roles in the progress of Lowell, and the activities of the Masonic Fraternity have benefited not only the members of that great organization, but have worked to the benefit of the entire community. With this in mind, the history of Masonry in Lowell becomes a history of interest to all. There are in the city twelve honorary members of the Supreme Council. 33°, of the Northern Masonic Jurisdiction and one Active Member of that body, which is an unusually large number for a city of this size. On June 6, 1926, a very disastrous fire occurred in Lowell which caused complete destruction of the ample Masonic apartments in that city, including the loss of every item of Masonic property except about a dozen oil portraits. On the day after the fire the Low-Mi Masonic Association met and appointed a committee to formulate plans for rehabilitation. Temporary and satisfactory quarts were at once secured in the First Universalist Church, which were used until October, 1929. The Committee, after serious consideration of rental propositions, finally decided report in favor of the erection of a new Temple Land was secured on Dutton Street, very near the center of the city, but removed slightly from the traffic nuisance. A financial program was accepted at a mass meeting of the Masons of Lowell under which each member of the Lowell Lodges should contribute $100.00 towards the erection of a new Temple. The cost of land and furnishings was to be covered by funds already available. Building plans were prepared which received the approval of the Fraternity and a campaign to secure funds was quite successful. So much so that ground broken in November 1927 and in spite of delays caused by matters outside of the control of the Building Committee, the cornerstone was in September 1928 by the Most Worshipful Grand Master and Grand Officers in the presence of 2500 Masons and many thousands of the public. The Temple was dedicated by the Most Worshipful Grand Master in October, 1929, after the building had been thrown open for the inspection of over 10,000 visitors. The building is of the Greek type of architecture and the accommodations ample for the various Masonic-groups that occupy it. The entrance is into a large entrance vestibule 21 feet wide leading to a foyer 25x40 feet. The entrance corridor is flanked on either side by a reception-room 33x28 and a smoking-room 23x26. A large coat-room is situated on the right of the foyer. Directly ahead of the foyer is the banquet hall, approximately 75 feet square seating 600 comfortably at tables. Fully equipped kitchen and serving rooms are on the rear of the building. 20x60 feet in size, both having a service entrance on Worthen Street. At the East end of this banquet hall is an entertainment platform 17x20 in size with two dressing-rooms conveniently located. As this banquet hall is on the ground floor, the fire safety is practically 100 per cent. From the foyer an easy run of stairs brings one to the Lodge rooms, Grecian Hall and Egyptian Hall. An ample corridor leads from the front to the rear of the building where an exit is provided and also an officers' room which gives convenient access to the East of the Lodge Room and also the platform. Grecian Hall is about 48x80 feet in size, seating 300 people and with an excess capacity of 700. It is decorated in severe Grecian style. The ceiling is very finely treated with cloud effect and the complete electrical equipment of the building gives all the color effects desired. This vaulted ceiling is studded with stars correctly placed in constellation groups. The furniture of this hall is plain heavy mahogany richly upholstered in blue. The floor covering is heavy pile carpet in an unobtrusive harmonizing tone and design. Back of the chairs in the Masonic East is a rich drapery which when drawn aside exposes a platform 20x48 in size. This is fully equipped with all paraphernalia and electrical effects for the presentation of dramatic and costume degrees. The organ in this room is a Frazee of ample capacity for all Masonic work. Immediately adjoining Grecian Hall, and separated only by an entrance corridor is Egyptian Hall. 28x60, s"atintr 125 usually, but with a capacity of over 200. The decorations of this hall are Egyptian in every detail and it is considered one of the most attractive small Lodge rooms in the Jurisdiction. Immediately over Egyptian Hall is the Sodality Hall of the same size and fully equipped for Lodge work. Both of these halls have smaller organs of ample capacity. On the third and fourth floors immediately over the main corridor are the armories and guard room for the Commandery. These armories are each 28x104 feet and contain GOO individual steel regalia lockers and a comfortable lounging room for the officers and guard of the Commandery. 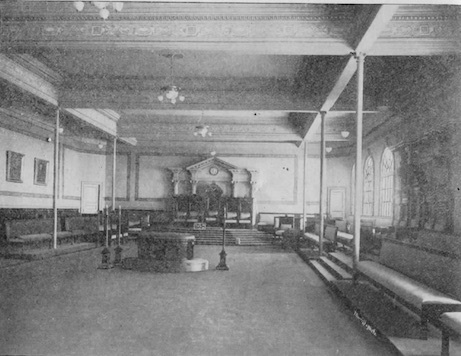 In the front of the building on the second and third floors are the social quarters consisting of a large reading-room, 28x44, and over it the club room for billiards and pool, 28x78 feet in size. The whole building is heated by oil and the ventilation system is of the latest approved type. On the day of dedication the Temple was found to be completely furnished and fully equipped. No necessary detail remains unfinished. There is no mortgage on the property and a small debt is amply covered by money pledged by members which is being paid in regular installments. The increased cost of maintenance over the former rented apartments amounts to an average cost of $2.50 per member per annum. The committee in charge of the erection of this building consisted of: Arthur D. Prince, Frank L. Weaver, Harry G. Pollard, Avery B. Clark, Charles E. Bartlett. The above modest account of a beautiful building furnished by the chairman of the Building committee, Most Worshipful Arthur D. Prince, does not indicate the amount of devoted labor on the part of the committee, and particularly its chairman. Anyone familiar with the innumerable details attendant upon the execution of any building enterprise may form some idea of the immensity of the undertaking. Too much praise cannot be given Most Worshipful Brother Prince and the members of the Committee. The Craft in Lowell is to be congratulated upon having men of such fine Masonic spirit in their membership. This page was last modified on 19 July 2018, at 17:02.